RMA’s Soft Thresholds is an Exhibition About Boundaries. 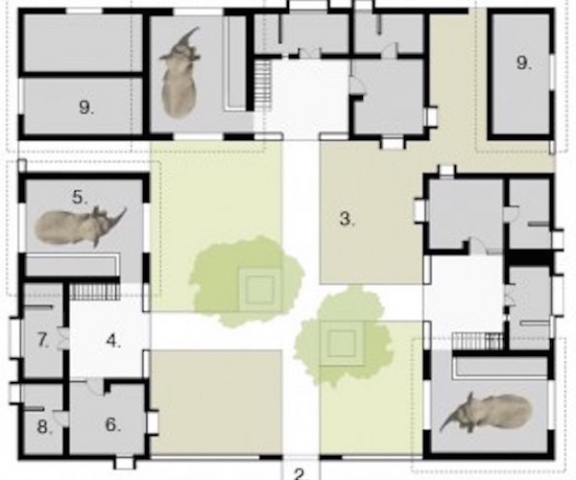 Elephant Housing Floor Plan by RMA Architects, Drawing by RMA Architects. Hathiagaon, Elephant Village by RMA Architects, Photo by RMA Architects. Elephant Housing Elevation by RMA Architects, Drawing by RMA Architects. A mahout is a person who drives and takes care of individual elephants. It is a life-time career for both the human and the elephant, a tradition carried on by extremely knowledgeable, highly experienced individuals. Not only are they well-versed in elephant-rearing skills, but they cultivate an intimacy with their particular pachyderm. Master mahouts possess an exceptional ability to communicate and control their elephants with uncomplicated verbal commands and simple touches. Ideally, the mahouts and their elephants live as close together as possible. But what about housing caretakers and their elephant wards? The elegant solution to this problem was the creation of a Hathigaon (or elephant village), which is located in the foothills of the Amber Palace and Fort, near Jaipur, India. Here the families of the mahouts live close to their charges—literally in the same housing units. Send that misbehaving elephant to his room. The delightful illustrations of the design for the elephant village were part of the exhibition Soft Thresholds, which could be viewed in the expansive first floor lobby space at Boston’s finest design museum, Harvard University’s Graduate School of Design. The Hathigaon was one of a number of architectural jewels displayed by the Indian-American firm RMA Architects in this stunning exhibit. 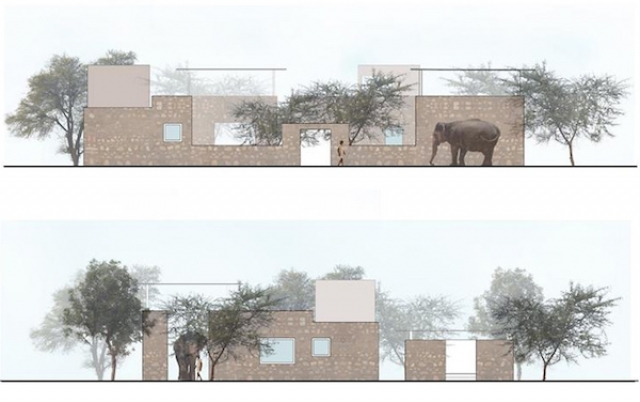 The RMA design team’s drawings of the elephant village include scaled images of actual elephants. This detailed approach is both unusual and enthralling; the presentation of plans, elevations, and descriptions made the project delightfully accessible. Drawing is used to tell a vibrant story, a charming narrative whose enrichment by visual, even visceral, experience, underscores the project’s functional value. RMA Architects was founded by GSD professor Rahul Mehrotra, a gifted architect and urban designer who is a superlative writer and teacher as well. It is an architectural practice with studios in both Mumbai, India and Boston. The firm’s practice engages with a diverse range of clients, including governmental and non-governmental agencies, corporate and private clients, and nonprofit institutions. The firm also acts as an advocacy group in the city of Mumbai, taking on architectural and urban design work. The firm’s projects include the design of residential, office, institutional, art galleries, and retail buildings, as well as the architectural conservation of significant historical structures. The studio works collaboratively, and creatively, with local craftspeople, developing and refining construction details and building methods that are traditional, sustainable, and generated by local knowledge. Examples of the craft of local artisans were featured at the entrance of the Soft Thresholds exhibit. These woven bamboo screens acted as soft walls between sections of the exhibit. This exhibition suggested the imaginative ways that the firm navigated the various intertwined forces (governmental, cultural, historical and spiritual) that have a stake in shaping and conserving space in India. In these efforts, form follows function almost organically. The observer may ask what comes first — the form or the function? The firm’s approach is about symbiosis: there’s no telling which came first, the chicken or the egg. Initially, the thoughtful design strategy for the elephant village involved structuring the landscape of the site, which had been previously devastated by its former use as a sand quarry. The first step was to create a series of storage places that would collect the rainwater runoff, the most crucial resource given the village’s desert climate location. With that element of conservation in place, an extensive tree-plantation program was established, reinforced by seeding the site to propagate local grass species. Establishing the water supply was a critical component of the design, serving not only to rejuvenate the landscape but also to facilitate the bonding between the mahout and his elephant through the process of bathing. This nurturing arrangement is crucial both for the health of the animal as well as the mutual attachment of human and elephant. Thus RMA attempts to incorporate the richness found at the intersection of multiple disciplinary perspectives. They see past the compulsive drive of architecture to create autonomous objects that separate themselves from the surrounding environment. The firm continually explores whether or not architecture and planning can intentionally construct soft thresholds. These are thresholds where lines can be easily traversed, even temporarily erased, thereby allowing for multiple perspectives across different modes of research and practice, including cultural, structural and spiritual barriers and limitations. 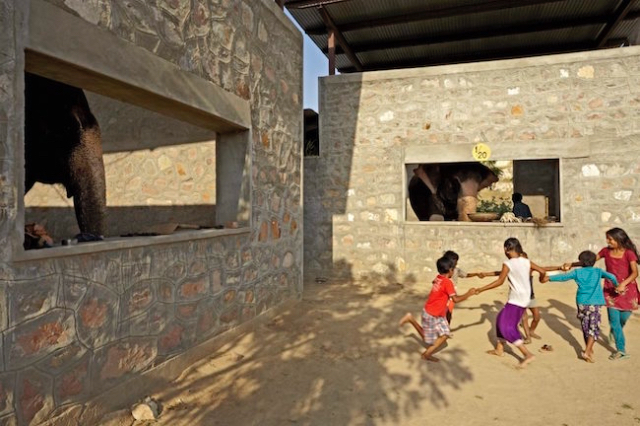 Soft Thresholds is about opening up physical boundaries: an elephant village is a marvelous example of this commitment. Along with the elephant village, Soft Thresholds included examples of more fine work from the firm, including a spectacular yet sensitive restoration of the World Heritage site, the Taj Mahal, a structure for the Public Health and Design Agency that included a community toilet project (yes, a communal toilet project), and a Magic Bus for an NGO’s children’s service. Also inspirational: a focus on the Indian craftsmen and women who assisted with the architectural detailing found in the distinct “rooms” of the exhibition. Exacting scale models demonstrated RMA’s dedication to clearly communicating its vision to clients. This article was republished from "Arts Fuse" by permission.